Time for one of my more light-hearted stories from on the road. This one dates back 27 years to 1991. I had just begun working as an ENG sound engineer with Rob Newman. 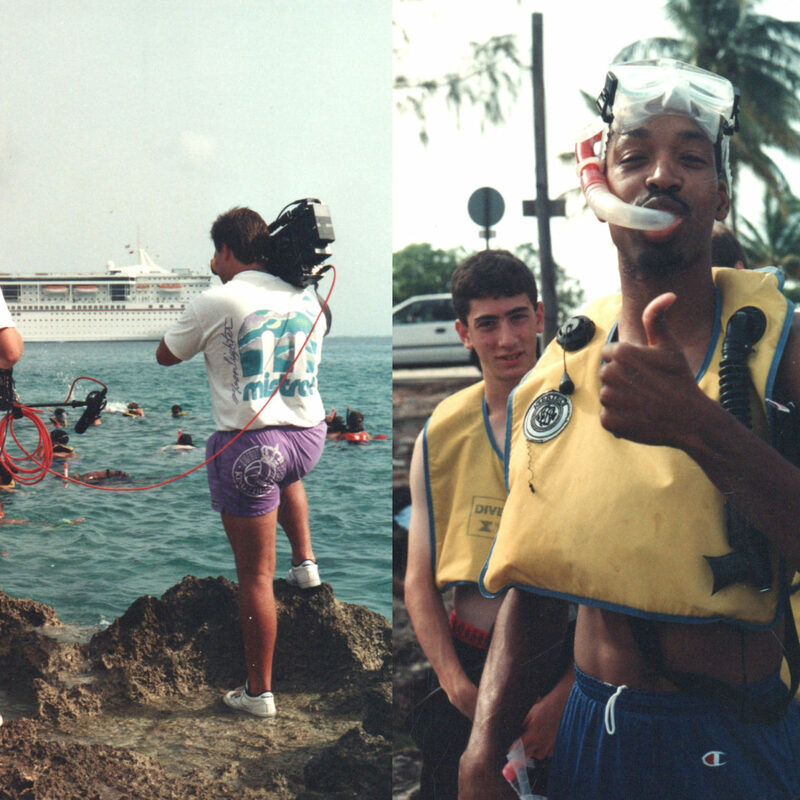 Much of our work those days was with the NBA. Things were really heating up with NBA coverage off the court thanks to shows like NBC’s Inside Stuff. It was postseason and our assignment was a rough one. Cover a handful of NBA players on a 5-day cruise (The NBA Allstar Cruise on Norwegian Cruiseline) in the Bahamas. Ah, ok! So off we went, headed to Florida armed with a handful of pelican cases packed with camera and sound gear. Loading, unloading from cars to planes, to the boat. Alas, arriving in a small cabin near deck level, Rob and I and our gear! 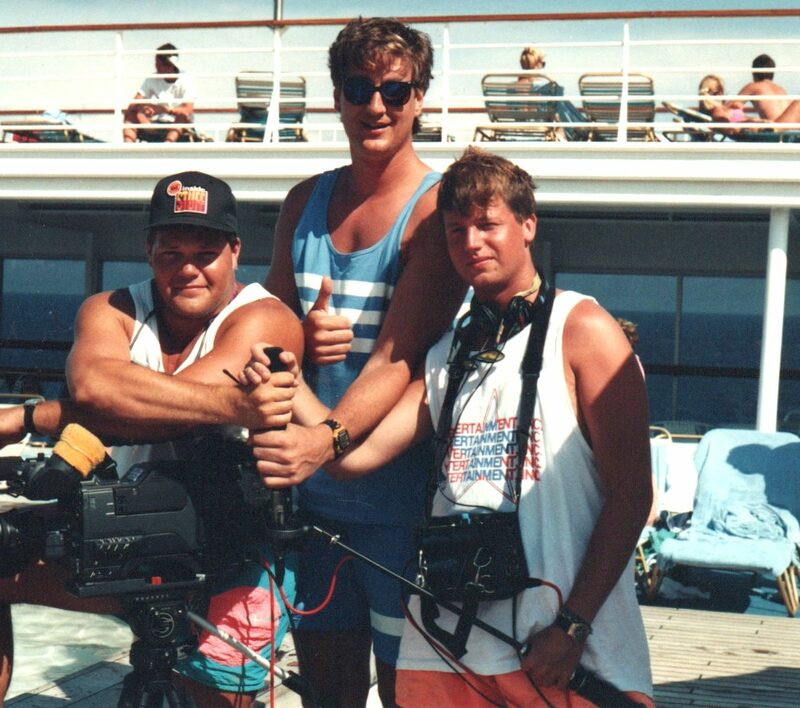 But seriously who cared, we were on an all-expenses-paid cruise to the Bahamas and we were getting paid! From there it was off to Norwegian’s private island, Jamaica, and Cozumel Mexico. Along the way, we followed the players around the boat as they interacted with fans, played a few organized boat games and sat for interviews. The handful of players on board ranged from your average level player to a few legends. Three of the most notable and memorable was Bill Cartwright of the Chicago Bulls, Scott Hastings of the Denver Nuggets and Robert Parish of the Boston Celtics. Robert Parish (The Chief) was always the professional, keeping to himself as The Chief always did, same with Bill Cartwright. Scott and a few of the other players, on the other hand, were always out ready to party. Photo: Rob Rauffer and Rob Newman with Scott Hastings on the deck. One of the most memorable events was hanging out after a day of shooting near sunset on a pretty empty top deck. It was Rob, myself and a few players of which included Scott. Scott had an open tab running and the bar waiter was ever attentive making sure we never ran dry. Now you have to picture this, I’m 6 foot on a good day (more like 5’11” and a half) and at the time I was pushing 155lbs, Scott is 6’10”, 250lbs with hands that could crush a beer can into the size of a golfball. He could down a beer faster than I could open it. As soon as that one was gone he had another on the way. In less than an hour, each of us had consumed a six pack and there was no sign of slowing up. The beers were coming so fast I had start ditching them under my deck chair. This continued for another hour until we all had to make our way to dinner. 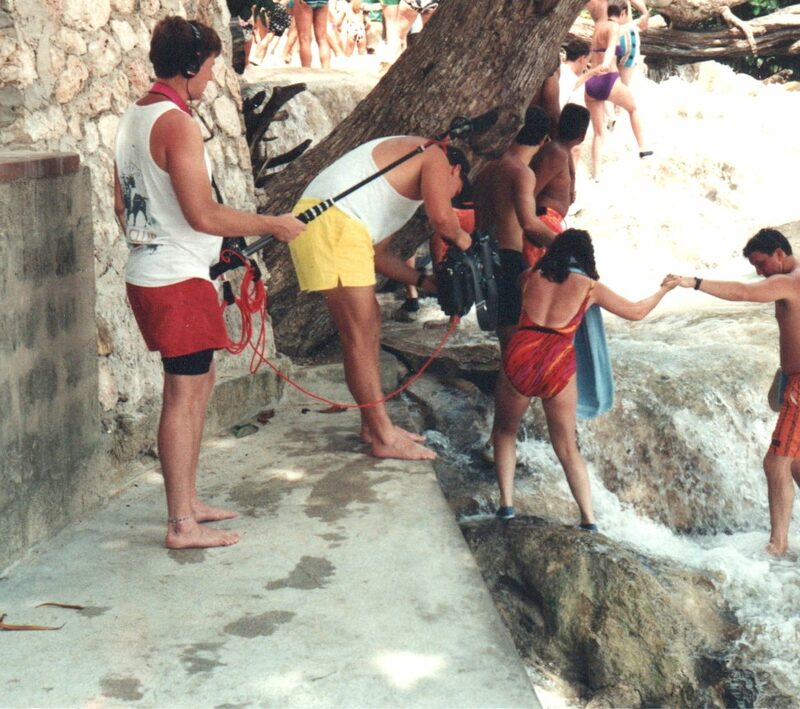 The cruise had several other memorable moments that included snorkeling with the players, making our way up Dunn’s River Falls with our camera and sound gear, and several other ports of call that included a long night of music and drinking with the players in Cozumel. All of this for a 3-minute piece that ran on Inside Stuff! The pictures capture a lot of the work and fun. Truly a memorable job. Rob Rauffer was a freelance ENG sound engineer from 1991 to 1997, he worked closely with Rob Newman of Boardwalk Productions whose clients includes NBA Entertainment, NFL, NBC, NHL, BET and more.